Title: The New Avengers Vs. The Old Avengers! Synopsis: Marvel Super Action #16 reprints the first part of Avengers Annual #2 (September 1968) in which the Avengers are transported through time by Dr. Doom’s time machine to 1963 where they face off against the original Avengers team of that era. The time traveling Scarlett Centurion has promised the 1963 Avengers that he will solve all of Earth’s ills if they agree to defeat all of the planet’s heroes and villains. The Avengers work their way through the Fantastic Four, Spider-Man, the X-Men, Sub-Mariner, Dr. Strange, S.H.I.E.L.D., Daredevil, and many villains, setting themselves up as virtual dictators of the planet. 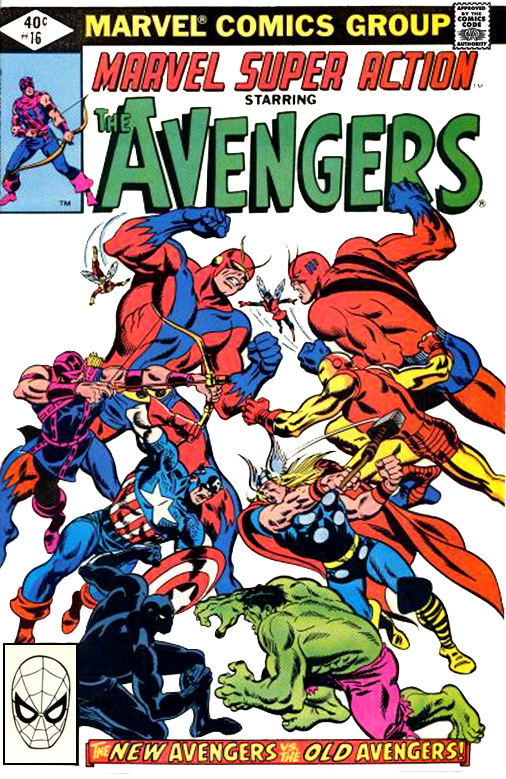 The 1968 Avengers learn that the Scarlett Centurion materialized after they defeated the Space Phantom in Avengers #2 (November 1963), changing history that they can only repair with the help of Dr. Doom’s time machine. The cover of this reprint has the same art as the cover of Avengers Annual #2 with a white background instead of the original black background.